Discussion in 'Indian Air Force' started by Agent_47, Feb 17, 2017. 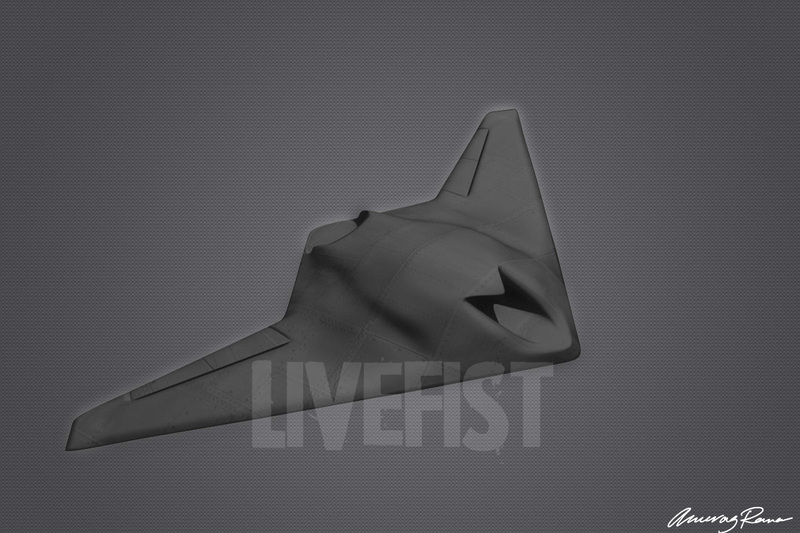 What we know so far for certain is that the Ghatak will be powered by a modified dry thrust version of the Kaveri engine (read on for more details of this modification), will sport a flying wing planform with internal weapons (as revealed in the first official images here on Livefist in 2012) and will sport stealth characteristics developed wholly in-house. Let’s now get into what hasn’t ever been reported before about the Ghatak/AURA programme. While the Aeronautical Development Agency (ADA) is overseeing the programme along with the Gas Turbine Research Establishment (GTRE), the real R&D is being frontfooted by two academic institutions: IIT Bombay and IIT Kanpur. Since 2013, low speed experiemental studies have been carried out on the Ghatak’s serpentine intake by a team at IIT Bombay. This team has been made a kind of mini ‘Skunk Works’ towards proving computational fluid dynamics on the Ghatak, with no limits on resources and access to facilities. Two, two specialised research teams at IIT Kanpur were roped in in 2015 for wind tunnel testing of a low RCS intake (work began in mid-2016). The second was even more significant — in November 2015, a team from IIT Kanpur was brought on board to conduct and study the autonomous flight of a low RCS aircraft configuration with a ducted fan for multiple flight modes. Scientists shared the following image with Livefist, never seen before, that provides the first official schematic of the power/thrust configuration on the Ghatak. Over the last three-four years, the Aeronautical Development Agency has been made aware by several foreign airframers, including stealth pioneer Lockheed-Martin, Dassault, Boeing, BAE Systems,and even MiG Corp that they’d be willing to assist the Ghatak programme in a possible variety of ways — either as offsets, or a commercial consultancy arrangement. Livefist can however confirm that the Narendra Modi government has decided that the stealth component of the Ghatak programme will be entirely in-house, and will be limited to academic institutions and private industry in country. Decisions of this kind have changed in the past (notably with the LCA Tejas programme), but the highest levels in government are clear at this time that programme ought to develop its own core technologies without external help. Scientists on the AURA/Ghatak programme confirm to Livefist that concept UCAV is tied in several ways to the fifth generation AMCA development (Livefist had a big update here this week on the AMCA), which itself could see technology infusions from a line-up of interested suitors, including Saab, Boeing and Dassault Aviation. The ‘Lead-in project’ sanction that the ADA obtained for the government was in fact a joint sanction for both programmes, given the huge number of common R&D elements, including shaping, materials, construction, intake geometry, data-links and avionics, weapons and of course the Kaveri engine. Top sources at ADA say that full project sanction for the modified Kaveri engine and the Ghatak will come likely late in 2018 once the design phase reaches a satisfactory stage. An interesting development: the precision guided weapons for the Ghatak will see extensive private sector participation. Companies like Vem Technologies and handful more presented their wares at this year’s Aero India show, including laser-guided weapons. An executive at Vem Technologies said they had been sounded out about building specialised weapons for India’s unmanned programmes, and that there would be future activity to demonstrate capabilities. Abingdonboy, IndiranChandiran, Pundrick and 6 others like this. This time around, they will make it and see this project through by themselves, unlike LCA. Technologies coming from Rafales, FGFA and AMCA will provide sufficient in-house knowledge and confidence to make AURA (I like AURA name instead of Ghatak) a reality in India. But I'd still prefer getting some consultation from France's Neuron team. We need these UCAVs flying over India ASAP. There is a hope in this project something that we couldnt imagine in LCA.Entire UCAV project is directly under the supervision of PMO.So far projects under the PMO is always successful including ISRO and DAE. Golden_Rule and SR-91 like this. lca-fan, AbRaj, IndiranChandiran and 2 others like this. please dont talk about nukes so easily as the other furm. it would be useful to just drop some precision munitions to destroy training camps. Along with the GAGAN system and the CARTOSATS watching the launch pads and the training cells, if we destroy those too many times, the economic feasibility will reduce. That should be the primary motive of Ghatak. the Ghatak NG can be a longer/extended range for use on IAC-I or IAC-II to patrol the seas without being detected. GSLV Mk III and IndiranChandiran like this. Anyway....I agree with you....They will mostly be used for delivering PGMs and Recon...But they might as well drop a small nuke I guess...I don't know...How much does a small Tactical Nuke Weigh !? 250 KG....!? PS : Members is a Tactical Nuke a more efficient Silo or a Bunker buster on a Weigh by Weigh Basis wrt a conventional one !? Any Ideas !? UPDATE / 7 MARCH: Livefist can now confirm that a metal full-scale model of the Ghatak is currently under fabrication by a private firm in Bengaluru in coordination with the Aeronautical Development Agency (ADA). The exercise was ordered late last year by DRDO chief Dr S. Christopher. The full-scale model will look to serve two preliminary purposes: gauge detection range and ‘dry’ radar cross section, i.e., prior to the application of in-development advanced low-observability/RCS reduction features and/or special coatings. Livefist has also learnt that the DRDO and Dassault Aviation are in detailed discussions on the utilisation of part of the latter’s offset commitments from the Rafale deal to bring advanced technologies and software (some of it from the nEUROn programme) to the Ghatak project and help speed things up till the full-scale engineering & design (FSED) phase. Teams from Dassault and ADA have met twice, with a third engagement likely in May this year. A team from ADA has also been invited to France to get a closer look at Dassault’s work in the UCAV space centred around the nEUROn programme. lca-fan, SR-91 and IndiranChandiran like this. Jai ho @AjitDoval we need more people like u. What goodies did u get from isreal n Russia? AbRaj, Aqwoyk and SR-91 like this. On an unrelated note but relevant to the larger subject , I've a feeling that this strategic partnership may culminate in India & France tying up for the AMCA with possibly Israel being brought in for a peripheral role . While there was a lot of speculation in this regard , recent developments indicate that's the direction we are headed in. Perhaps @PARIKRAMA could share more light on it. Sathya and AbRaj like this. France and Israel are old friends. Critical technologies will be developed in-house and all others will receive help from France, Isreal and Russia. Many technologies will come from Rafales. Ajit doval have worked out deals with all three countries. You'll have France help us with Kaveri, after years of people saying, nobody will depart with that tech, nobody, well, we will get it. We probably also get RAM coatings also along with other stuff. You'll have Isreal work with us on our sensors and radars. Russia will help develop 3d thrust vectoring technology. This is just a few important tech we will receive as part of offset packages. lca-fan, Golden_Rule, Sathya and 1 other person like this. EXCLUSIVE: What India's Stealth UCAV 'AURA' May Look Like.